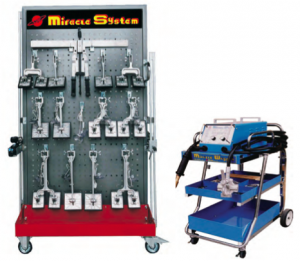 Dent Masters Corporation is proud to introduce to you the Miracle Panel Repair System from Japan. Based on the ISHIHARA method of panel repair technology, the Miracle Panel Repair System is designed to repair damaged body panels from the outside, thereby avoiding the strip and refit process normally involved in the repair of damaged body panels. Gone are the days when you had to strip and fit a panel to repair it. Gone are the days when TIME was a limitation to accepting cars for panel repair. No longer will a panel beater be reduced to doing the job of an artist, drawing lines and contours on panels filled with body filter. Give your panel beater his due, and your workshop the boost it needs. We bring to you a “Time machine” that will change the way you repair accident-damaged vehicles forever.